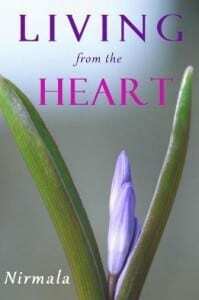 Living from the Heart by Nirmala was written in 2008 and it is presented here with the kind permission of the author. Living from the Heart consists of three pieces exploring living from the spiritual Heart. Part One offers simple ways to drop awareness into the Heart and thereby shift into a more open, allowing perspective. It goes on to explore dropping awareness into the belly and ultimately into the larger spiritual Heart, which includes the mind, heart and belly. It turns out it doesn’t matter what you experience, what matters is where you experience it from. Part Two, The Heart’s Wisdom, explains how the Heart is a wise guide to the truth. The truth is whatever opens your Heart and quiets your mind. This definition cuts through any confusing ideas and beliefs to the direct source of wisdom and guidance available in your own Heart. Part Three, Love Is for Giving, points to the true source of love in your own Heart. The essence of love is the spacious, open attention of our awareness. It touches everything but doesn’t impose or make demands. Surprisingly, this awareness, or love, is experienced most fully when you give it to others, not when you get it from others. Living from the Heart consists of three pieces exploring living from the spiritual Heart.